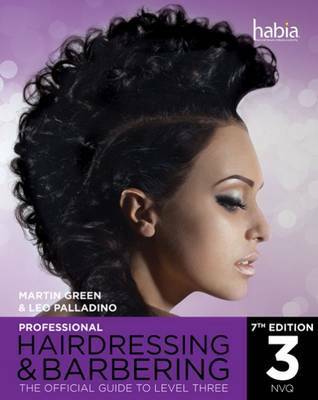 This new edition of Professional Hairdressing retains its status of the only level 3 guide to be fully endorsed by Habia and is the only official guide to Hairdressing at Level 3. This new and aspiring textbook is aligned with the latest National Occupational Standards and as the content is not mapped to a specific awarding body, it can be utilised for all Level 3 hairdressing courses. Written by leading industry Authors, Professional Hairdressing maps out level 3 standards with clarity and focus, complete with new text design and professionally photographed step-by-step guidance. Its new approach puts emphasis a more practical skill base and includes additional focus on developing students' aptitude for business. An extensive range of activities, projects and practice multiple choice questions are together at the back of the book for independent training and study. This new edition is also available with CourseMate online teaching and learning resource which offers engaging and interactive resources such as integrated eBook, videos, step-by-steps, images, activities and games, all aligned to the content of the textbook for a fully integrated learning experience. 1.Consultation and advice - Provide hairdressing consultation services. 2.Promote services and products - Promote additional services or products to clients. 3.Customer services - Support client service improvements. 4.Creative cutting - Creatively cut hair using a combination of techniques. 5.Creative barbering - Creatively cut hair using a combination of barbering techniques. 6.Styling beards and moustaches - Design and create a range of facial hair shapes. 7.Shaving - Provide shaving services. 8.Creatively style and dress hair - Creatively style and dress hair. 9.Hair extensions - Provide creative hair extension services. 10.Colouring hair - Colour hair using a variety of techniques. 11.Colour correction - Provide colour correction services. 12.Perming hair - Create a variety of permed effects. 14.Health and Safety - Monitor procedures to safely control work operations. 15.Being effective in your work - Contribute to the financial effectiveness of the business. 16.Planning promotional activities - Contribute to the planning and implementation of promotional activities.